A record hailstone fell in northern Alabama during the evening of March 19th, 2018 as a line of supercell thunderstorms moved easterly across the state. 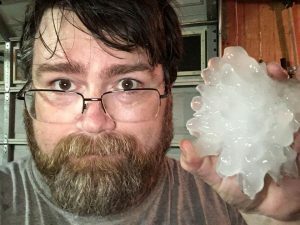 Craig Mann, a reporter with The Cullman Tribune, found and preserved one of these enormous hailstones in his freezer until meteorologists with the National Weather Service (NWS) office in Huntsville, AL could arrive to take an official measurement of the hailstone. On March 21, 2018, the preserved hailstone measured approximately 5.25 inches in peak width, with a circumference of 13.75 inches, and weighed 8.9 ounces making it officially the largest hailstone recorded in the state of Alabama.